Across the southwest is a cartoonish squirrel that wears a gray tuxedo and tassles on his ears. I got to see the Abert squirrel in New Mexico recently. 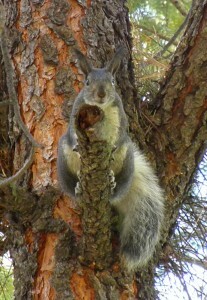 They live across a broad region, but only at higher elevation and where they can eat ponderosa pine seeds. They chatter at intruders, but still put on enough of a show that you can see them. They’re named after John James Abert, who mapped the west. They don’t care whether or not you put an ‘s after their name; either Abert or Abert’s is fine. So is tassle-eared squirrel. If you’re being formal, they’re Sciurus aberti. The Abert’s squirrel is only found in Arizona, Utah, New Mexico, Colorado, a bit of Wyoming and Mexico. It has nine subspecies, the Forest Service says. 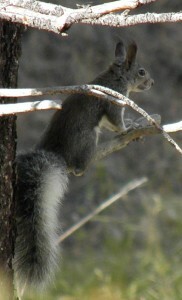 The most famous of which is the Kaibab Squirrel found on the Kaibab Plains of the Grand Canyon. Geneticists think they are evolving apart in their separate little populations. I strongly suspect these subspecies might be lumped together some day because the only thing that really seems to distinguish them is geography. Since I was in the Gila National Forest, I was seeing Sciurus aberti chuscensis, though not even the most smarty-pants animal people I met out there called it anything but an Abert’s Squirrel. Thanks for your entire efforts on this blog. Gloria delights in working on investigation and it’s really obvious why. My spouse and i learn all regarding the lively method you offer efficient tips and hints by means of this web blog and therefore boost response from other ones on this article then my child is undoubtedly learning a whole lot. Have fun with the remaining portion of the year. You’re doing a good job.